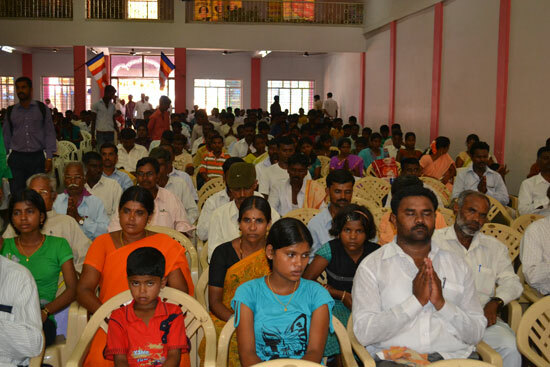 Udupi, 24 May 2011: As a part of the 2600th birth anniversary of Lord Gautama Buddha, a large number of Dalits from different parts of the Karnataka State embraced Buddhism (Dhamma Dheekshe) in the forenoon of Tuesday, May 24, 2011 at a function held at Shri Narayanaguru Sabha Bhavan, Bannanje, Udupi. The ?Dhamma Dheekshe? 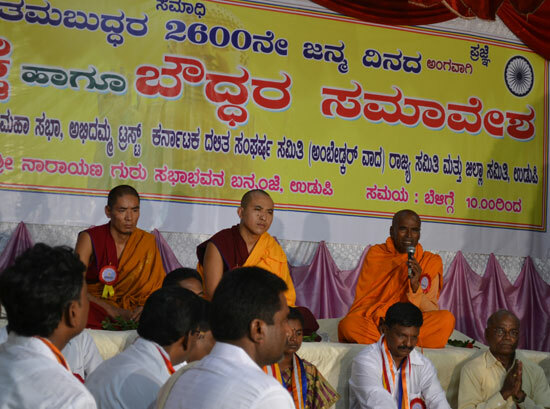 was administered by the Buddhist Monk, Manorakkhita Bhanteji in association with Monk Long Sang and Monk Ten guru. 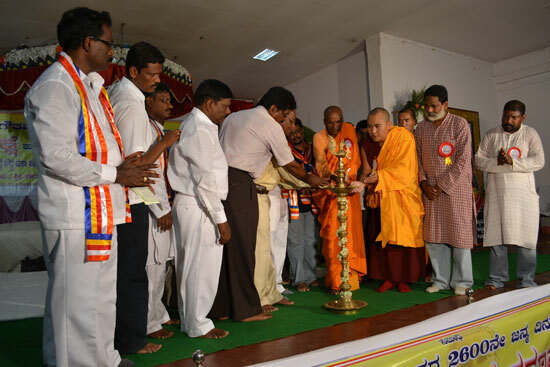 The Karnataka State level Buddhist Convention and the Dhamma Dheekshe were jointly organized by Karnataka Boudha Mahasabha, Karnataka Dalita Sangharasha Samiti(Ambedkarites), Dakshina Kannada District Boudha Mahasabha, Abhidamma Trust and Udupi District Committee. 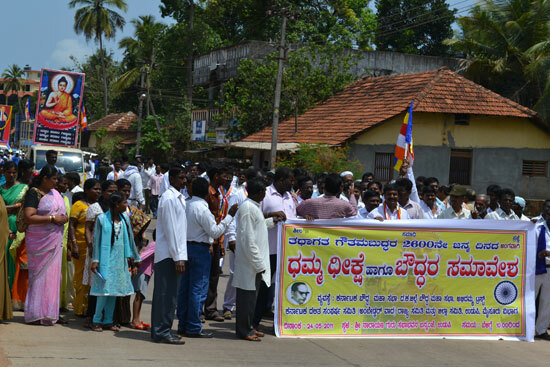 Prior to the convention and Dhamma Dheekshe, a procession was taken out by the Dalits from the Ambedkar Bhavan, Adi-Udupi to the Shri Narayanaguru Sabha Bhavan at Bannanje. 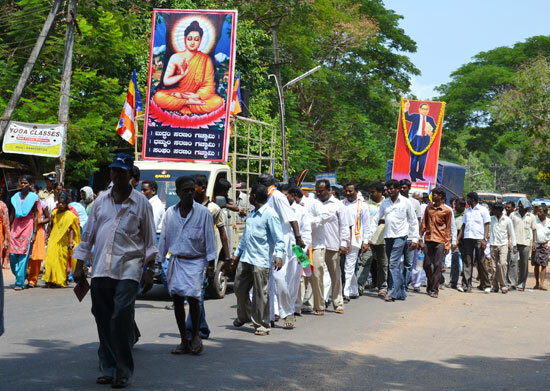 Two huge posters of Lord Gautama Buddha and Dr. B.R. 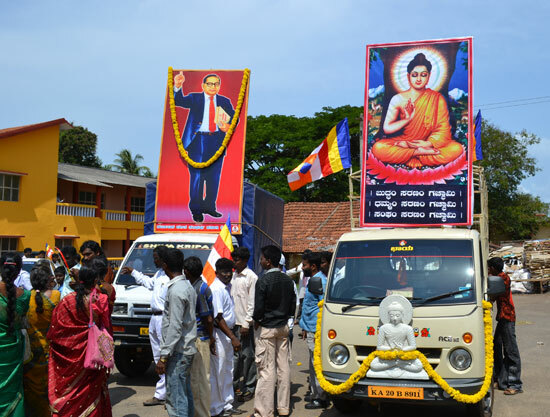 Ambedkar mounted on two separate vans were part of the procession. 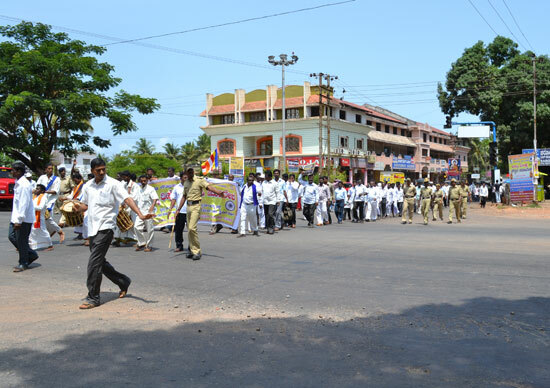 Chende and Nasik Band provided the necessary sound and music and there was elaborate security arrangement with a number of policemen accompanying the procession. 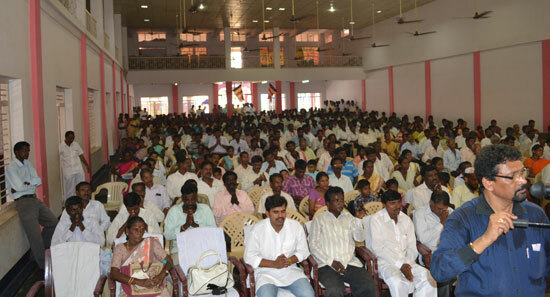 Shri Narayanaguru Sabha Bhavan was packed to the capacity. 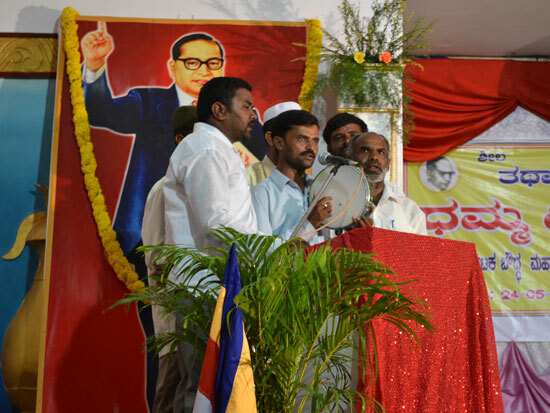 Prior to the Dhamma Dheekshe function, three Dalit groups presented revolutionary songs. Following the arrival of the Buddhist Monks-Manorakkhita Bhanteji, Long Sang and Ten guru, the stage was occupied by the dignitaries. 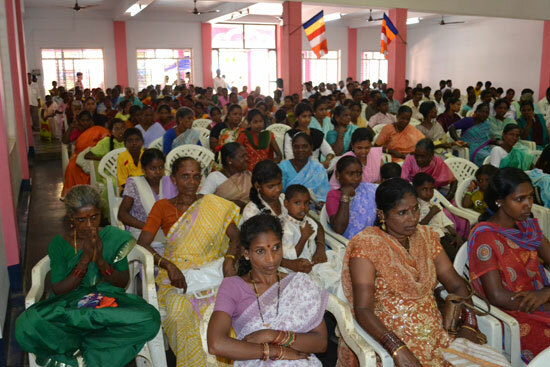 Before the commencement of the function, Monk Manorakkhita Bhanteji recited the invocations of ?Buddham, Dharmam and Sangam?. 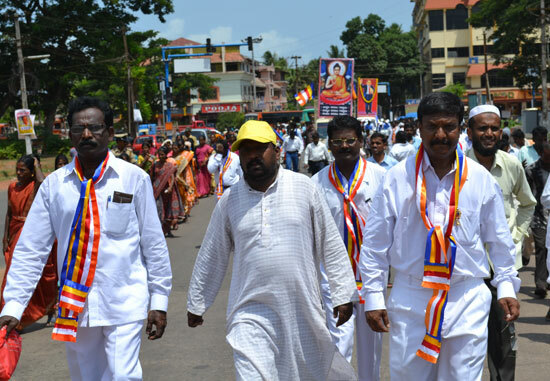 Thereafter, Sunder Master, member of the State Committee welcomed the Buddhist Monks and the dignitaries on the stage. 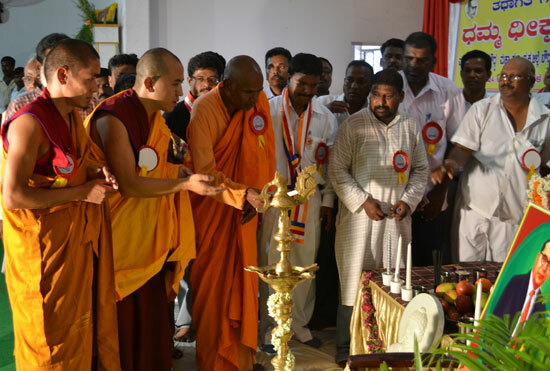 A formal inauguration of the Buddhist Convention and Dhamma Dheekshe programme was done by lighting candles in front of the image of Lord Buddha, followed by the lighting of the lamp by the Monks and the dignitaries on the stage including Mavalli Shankar, the Convener of State Committee. Saying that ?Dheekshe is not given but taken by the followers of Buddhism?, Monk Manorakkhita Bhanteji administered the ?Dhamma Dheekshe? 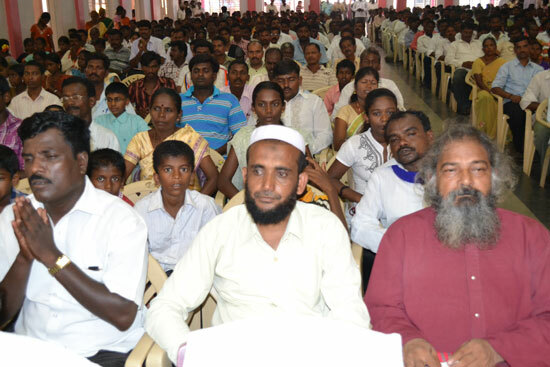 to all the Dalits who were present in the hall by reciting the ?shlokas? which were repeated by those embracing Buddhism with folded hands. 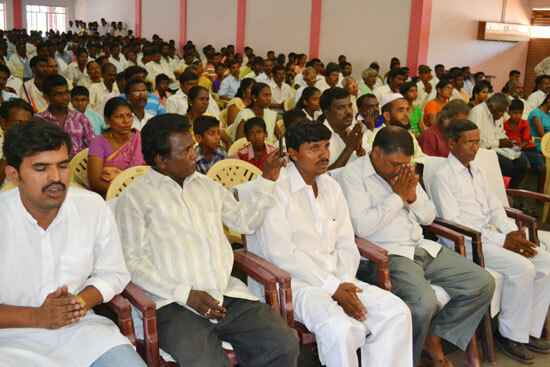 In his homily, Monk Manorakkhita Bhanteji said that Buddhism is neither optimistic, nor pessimistic, but realistic. He said that from this day all those who have had embraced Buddhism should give up worshipping the multiple gods and goddesses that they had been worshipping so far and take shelter under ?Buddha, Dharma and Sangha?. He further said that after his conversion to Buddhism, Dr. B.R. 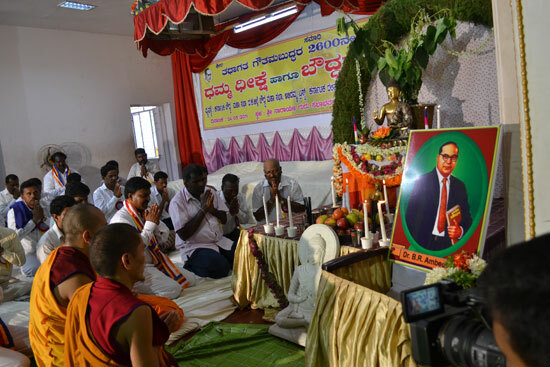 Ambedkar met a Buddhist Monk from Burma who had given him 22 Pledges which he in turn asked his followers to abide by. The same 22 Pledges were recited by Monk Manorakkhita Bhanteji which were repeated by those who had embraced Buddhism as their religion. 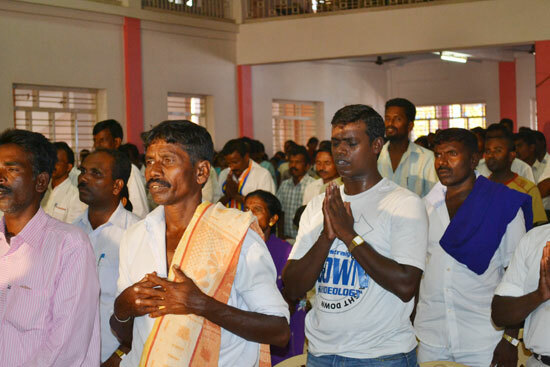 These 22 Pledges included renouncing the worship of deities and invoking ?Buddha, Dhamma and Sangha?, not getting the marriages of their children solemnized by Brahmins, adherence to non-violence and not harming animals, not to steal, not to tell lies, not to consume intoxicants and follow other ethical and moral principles. 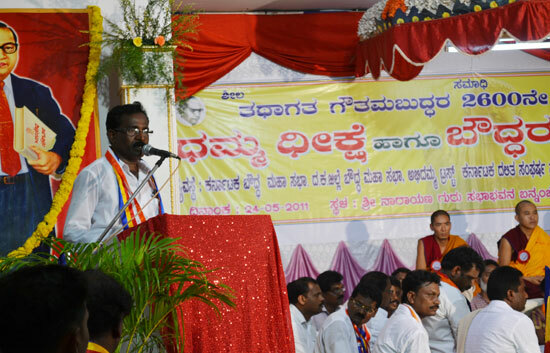 Following the Dhamma Dheekshe, Monk Manorakkhita Bhanteji said that there are many religious traditions in India. 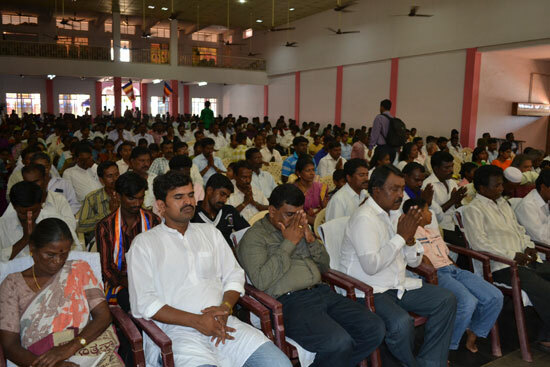 However, he highlighted that Buddhism had a special appeal not only to the people of India but also outside India. He said that Buddhism is chiefly based on the principle of Four Noble Truths: That the world is full of suffering; desire and attachment are the causes of the suffering; in order to be free from suffering, one has to be free from desires and attachments; and in order to be free from these one has to follow the right path or the middle path, that is, the Eightfold Path. He made an appeal to the people to follow the right path of truth and justice and improve their physical and mental condition by acquiring education and knowledge and contribute to the family wellbeing, progress of the society and eventually to the development of the nation.